In Ernest Hemingway’s “The Snows of Kilimanjaro,” the protagonist dies from an infection after scratching his leg on a thorn. That was in 1936, before the introduction of penicillin. It’s hard to imagine a world in which every cut had the potential to be fatal, but that’s the world our grandparents lived in. Thanks to decades of truly amazing biomedical research, we live in a much safer world today. What’s equally exciting is that yesterday’s triumphs may pale beside the promise of tomorrow’s breakthroughs — if pressures on research funding don’t threaten the future of biomedical research. For generations, America has been the world leader in biomedical research innovation. Lately, though, it has been losing its preeminence in discovery to other countries. This not only threatens the creation of new therapies but also imperils an industry that supports more than 300,000 jobs. 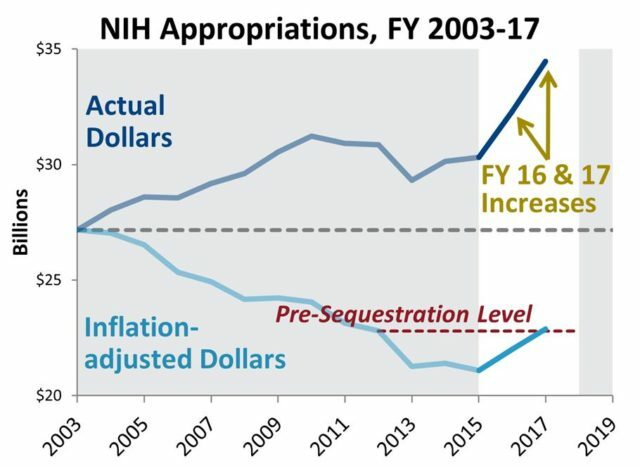 Declining levels of federal funding for biomedical research, along with inefficient allocation of funds by the National Institutes of Health, are jeopardizing innovation. At the same time, universities and nonprofit research institutes are experiencing funding cuts at the state level. In some instances, private philanthropy and disease-specific foundations have increased funding for biomedical research, but this is but a small piece of the pie that does not make up for the federal funding shortfall. Charitable giving is not able to fill the gap, and cannot be expected to do that. This funding crisis comes at a time when we are on the precipice of a revolution in biomedical research started by the sequencing of the human genome and the astounding progress in drug development for some of our most devastating diseases. The 21st century can become the century of biology and medicine by turning more disease interventions into cures and accelerating the pace of basic research necessary to increase health outcomes and life expectancy. We address these threats with a call for a renewed commitment to federal funding for biomedical research. We suggest ways to reform and bolster the NIH and recommend new steps to integrate public and private research, including bringing together the biomedical research establishment and change-oriented philanthropists. From “The Anatomy of Medical Research: U.S. and International Comparisons” by Hamilton Moses III and colleagues. JAMA 2015; 313(2):174-89. Used with permission. A healthy life science ecosystem requires investment in basic research, translation of discoveries, and the development of new therapies that enhance and improve human health. In the U.S., the federal government provides core sources of support for basic biomedical research and development. In general terms, 64 percent of all applied biomedical R&D funding comes from within the industry, while just 22 percent comes from the federal government. Federal research funding of academic-based basic and translational research is where nearly all breakthroughs originate. 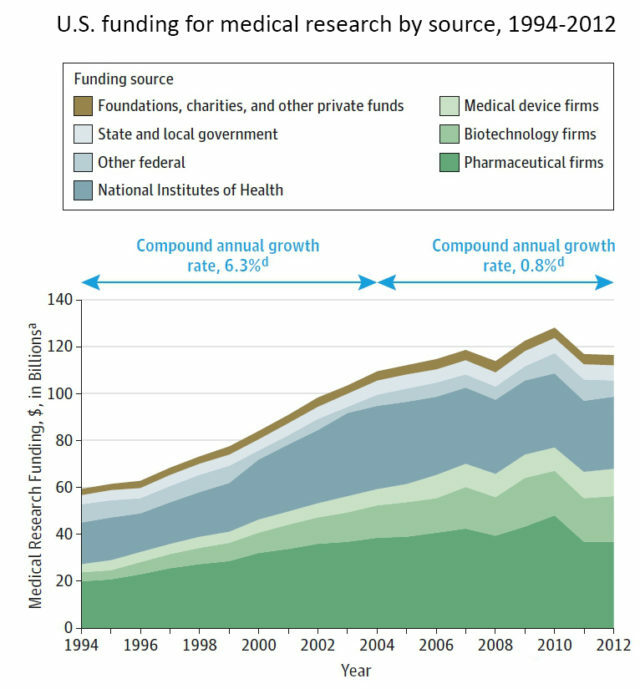 Yet federal support for biomedical research is less than one-quarter of all federal R&D efforts. Depending on the outcome of negotiations between the Senate and House of Representatives, the 2018 budget for the NIH will be between $34 billion and $36 billion. Although that represents a $1 billion to $2 billion increase over the 2017 budget, and is significantly more than what the Trump administration has proposed, the funding trajectory over the last 25 years has been downward. Adjusted for inflation, in terms of purchasing power, the NIH budget is down 19.2 percent from 2003. In stark contrast, other countries are promoting biomedical research. China, for example, has committed very large governmental resources to building a world class biomedical research capacity. We believe that the decline in federal funding for biomedical research has caused two significant problems. First, fewer grant applications are funded, which reduces the rate of discovery. Second, we are losing a generation of brilliant minds who do not see a future in basic biomedical research. Although the NIH has recently increased support for young investigators, funding for this program is not robust. The decline in the number of grants to scientists under age 46reflects the shrinking number of young people going into science. Research and development must encompass both basic research and translational work. Yet it is difficult for translational work to occur unless there is a strong basic research platform. Just this year, Nobel prizes have been awarded to basic research on seemingly obscure areas of biology such as circadian rhythms and fruit flies. In the realm of the immediately practical, without basic research there would have been no breakthroughs in cancer immunotherapy. What we need is predictable federal funding: a longer-term budget for the NIH backed by Congress’s enduring commitment to research. Since revitalizing our nation’s commitment to research cannot be paid for by taxpayers alone, we also urge a concerted effort by industry and philanthropists to grow both the basic and translational research enterprises. Life sciences companies sometimes pay royalties to universities or nonprofit research institutes to license products that were developed based on NIH-supported research. Yet there is no material stream of royalty revenue coming back to the NIH. Considering that many medicines and medical devices would not exist without taxpayer support conveyed through the NIH, this arrangement represents a missed opportunity. We advocate that a small royalty or industry fee be paid to the NIH and allocated to the NIH Common Fund to support increased funding for the High Risk, High Reward Research Program or the creation of a revenue-generating strategy by which profitable biopharmaceutical firms pay a flat fee in recognition of the fundamental building blocks of discovery from the NIH that broadly benefit every sector. Rules and conditions for such fees would be set by Congress and should be used to supplement existing NIH appropriations, not to replace them. At the core of these ideas is this principle: Taxpayers and the federal research enterprise should benefit when government-subsidized inventions turn into successful commercial products. Inadequate funding can be further compromised by inadequate infrastructure. The NIH funds both intramural research (NIH employees) and extramural research (grants to universities and other research entities) at a ratio of approximately 1 to 10. The NIH’s intramural program has become overly conservative, short-sighted, and slow to react to opportunity — a conclusion drawn from an independent review that highlighted various deficiencies and areas for reform. NIH intramural research has produced medical breakthroughs — most recently by John Schiller and Douglas Lowy. Today, though, many talented and ambitious scientists eschew the NIH intramural program because its research is not bold enough. The odds of it yielding breakthrough research in the future have declined dramatically due to unpredictable funding, red tape, and insufficient attention to the importance of younger bold investigators. To revitalize its intramural program, the NIH must foster a philosophy that embraces risk and failure and gives the program the freedom to perform high-risk, innovative research, free from grant writing and the vagaries of unstable financial support. Raising the quality of NIH intramural research can also be accomplished by dedicating funds to grand scientific challenges in biology with interactions and joint projects between the intramural and extramural research communities, including developing new research models. Creating a “strike force” of experts to address acute threats like Zika, Ebola, and other emerging infectious diseases could also help. The U.S. pharmaceutical industry spends around $50 billion a year on research and development. These for-profit companies generally don’t conduct basic biomedical research. When they do, the data from this work do not usually become part of the scientific commons, unlike data from NIH-funded research. What’s the path forward? The pharmaceutical industry should continue to support its own basic biomedical research while at the same time extending its collaborative work with the nonprofit community. Many large drug companies have already recognized the wisdom of depending more on externally acquired discoveries, from both academia and the pharmaceutical and biotechnology industries. That’s why more than 50 percent of large company drug approvals derive from smaller firms. More aggressive collaboration with the nonprofit sector will drive down costs, as will more openness in sharing data from clinical trial results. The pharmaceutical industry can create consortia to develop precompetitive data and tools for drug development, and set voluntary standards to improve the likelihood of scientific accuracy through appropriate commitments to replicate research results. Industry leaders can also work with the nonprofit and philanthropic communities on tissue sampling, data analytics, and sequencing standards for specific diseases. Other innovations are emerging from industry-university partnerships, including support for incubators and accelerators underwritten by large companies and sometimes by venture capital firms with an eye to helping university projects survive the so-called valley of death between invention and commercialization. Universities partnering with private equity, venture capital, and established drug companies seek to convert their research assets into companies that can later be sold. This increases the implicit value of the inventions that universities originate while offering industry a valuable new method of increasing R&D productivity and risk mitigation. Alongside academia-industry partnerships, philanthropy is playing an increasingly important and direct role in funding biomedical research. Many philanthropic donors are developing innovative business models to assure the sustainability of investments in research. Examples include the Parker Institute for Cancer Immunotherapy, with which we are associated; the Howard Hughes Medical Institute; the Bill and Melinda Gates Foundation; the Chan Zuckerberg Initiative; and others. Early research on cancer immunotherapy, for example, was accelerated with philanthropic funding, rather than relying on just corporate or NIH funding. The two key ingredients of these new models are that they seek a return on philanthropic investment and they apply new methodologies to research design and execution. Organizations are keen to accelerate the pace and magnitude of scientific advances and develop sustainable funding models. In the past, patents derived from university research were simply granted to inventors’ institutions. It is becoming increasingly common today for philanthropic organizations to participate in royalty or milestone payments and, in some cases, invention management. These strategies ensure that both the philanthropic organization and the university share in returns that will sustain the engines of innovation and discovery. This creative “evergreening” approach to funding must be more widely embraced. The focus on collaboration pioneered by many philanthropic foundations and donors is essential. As part of their funding commitments, philanthropies now actively engage in creating structures requiring a collaborative, multidisciplinary focus among several institutions and scientists. For example, the Parker Institute has established six centers and more than 60 member researchers at leading academic institutions as part of its funding of research and clinical trials to advance cancer immunotherapy. These centers share data and research, work as cross-institution teams on key scientific objectives, and manage the creation of intellectual property in a collaborative manner. Although the pace of progress in biomedical science may not always be as speedy as advances in computing, there is no question that opportunities exist for accelerating progress. What’s lacking is adequate funding and enabling more efficient biomedical research infrastructure. Little has changed in the past decade in the way we study and act upon new biological paradigms. We need aggressive structural and cultural changes to the federal research enterprise that provides change-oriented leadership at all levels, support for people and programs that embrace new ideas, and greater emphasis on partnering between public and private organizations. Not-for-profit and philanthropic organizations are best placed to facilitate these kinds of collaborative efforts. As neutral bodies, organizations like the Parker Institute can work with academic centers to remove some of the barriers that slow progress in health care. Increase the level of direct federal budget spending for the NIH in a stable and predictable manner. Impose a financial obligation on the private biomedical sector to add to NIH coffers. Require more data sharing by both public and private institutions and more collaboration in the pre-competitive industry space. Create new business models to accelerate the path from basic research to the development of new therapies. Encourage private foundations to advance more collaborative research models by breaking down the existing barriers that inhibit research collaborations and by supporting grand scientific challenges. Yesterday’s breakthroughs turned a world in which people lived in fear of all diseases into one in which many of Hamlet’s “thousand natural shocks” could be treated. To continue this progress, we need the funding and infrastructure for biomedical research that can deliver the breakthroughs of tomorrow.